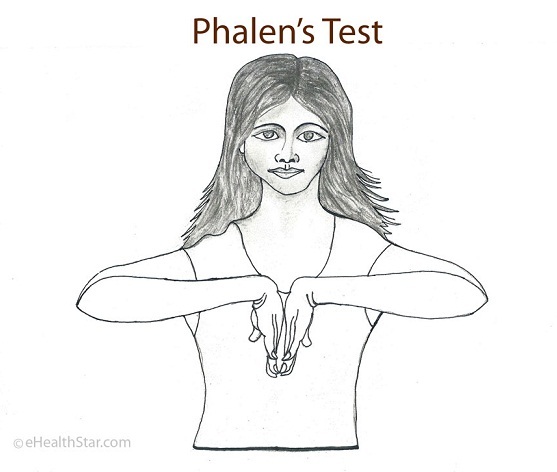 Phalen’s test is a provocative maneuver used in the diagnosis of carpal tunnel and Guyon’s canal syndrome 1,7. The test as originally described by its inventor Dr. George S. Phalen: A tested person places his or her elbows on the table and allows his or her hands to hang down freely for one minute (Picture 1) 3,5. Phalen strictly said no extra force should be used to flex the wrists 3. 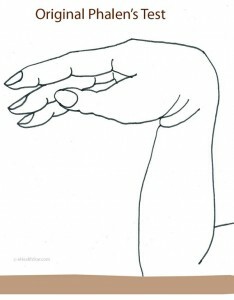 The maneuver increases the pressure on the median and ulnar nerve as they pass through the wrist 3. Tingling and burning in the thumb, index, middle and adjacent half of the ring finger speaks for carpal tunnel syndrome. Anyone can perform this test at home without significant danger for the nerves at the wrist 5. Many doctors now recommend using force when performing Phalen’s test (forced wrist flexion) 3: A person holds his or her forearms horizontally and then pushes backs of the hands together (inverse praying position to achieve maximal wrist flexion) for one minute (Picture 2) 3. This forced maneuver additionally increases the pressure on the median and ulnar nerve, but it can produce false positive results 5. This tests may increase the risk of the nerve damage, so do not try it at home 5. 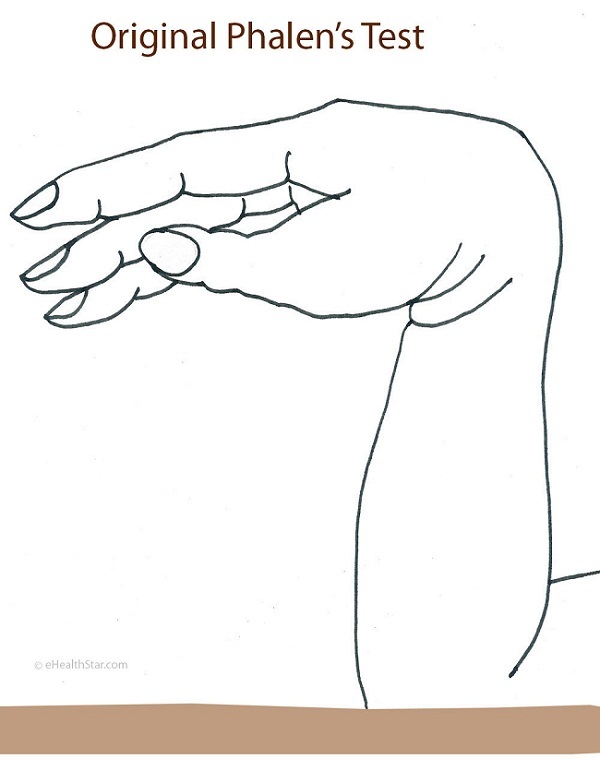 In another variant of this test, a doctor holds pressure with his or her fingers over the patient’s wrist who has hands in the Phalen’s position 6. In a modified Phalen’s test, the sensitivity of the fingers is tested with a standard monofilament while a tested person holds his or her hands in the Phalen’s position 8. According to the researches from the Reeves County Hospital in Texas, U.S., the modified Phalen’s test is more sensitive and specific than the classical Phalen’s test 8. 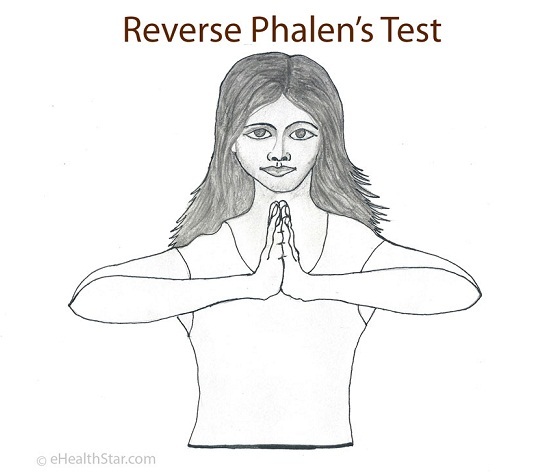 In reverse Phalen’s test, a tested person pushes his or her palms together in a praying position for one minute (Picture 3) 3. According to some authors, this test is more 3, but according to others 5, less specific than the classical Phalen’s test. The test (any of the three variants described above) is positive for carpal tunnel syndrome, when it triggers burning and tingling (paresthesia) in the thumb, index, middle and the adjacent half of the ring finger and pain in the wrist within one minute of the test; this is called Phalen’s sign 4. The test is negative when it does not produce symptoms within three minutes of the test 3. The test is positive for Guyon’s canal syndrome, when it triggers tingling in the last two fingers — pinky and the adjacent half of the ring finger 7. According to various sensitivity estimations, the test can reveal carpal tunnel syndrome in 40-88% 1,3,8. Specificity: When the test is positive, in about 80% the cause is carpal tunnel syndrome 1,4. The test is most specific in moderate or severe median nerve entrapment and when it produces symptoms in the first 30 seconds 1,2. The test can be false positive in about 20% — it can trigger symptoms in a person with normal wrists 2,3. Phalen’s test got the name after an American hand surgeon George. S. Phalen 4. Phalen’s maneuver is not 100% reliable in the diagnosing carpal tunnel syndrome, so in doubtful cases, electromyographic (EMG) studies may be necessary 3. Additionally, in individuals with limited motion of the wrists, the tests cannot be performed. Another test for carpal tunnel syndrome is Tinel’s test.